Solomans Island, MD to Hampton, VA – Take Two! 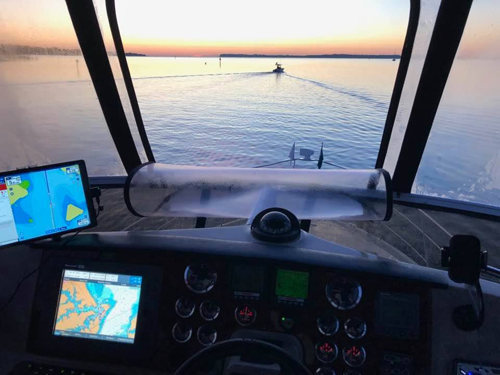 Our plan was to depart Solomans Island Wednesday, November 1st after a couple morning client calls. However, this day did not go as planned … or did it? We left the dock at 10:00 am and visited the Solomans Yacht Club fuel dock to take on 200 gallons of diesel. As we were leaving the harbor and entering the Chesapeake Bay we noticed the seas were a little rougher than all of the weather forecasts indicated. Ten minutes later while bumping along on plane out port engine suddenly shut down. My first thought was, “oh no, not another fuel issue!” But that was not the case as the engine would not even turn over – all power lost. We slowly motored back to the marina on the starboard engine where a few local fishermen helped us safely tie up at the dock. I called the local boat yard and explained our situation and a few hours later a skilled mechanic diagnosed the problem. The culprit was a $2 fuse that was part of our electronic control system. We replaced the fuse and the engine started immediately. It was now too late in the day to take on the 5-hour journey. While we were initially disappointed, there are two lessons we take away from this experience. 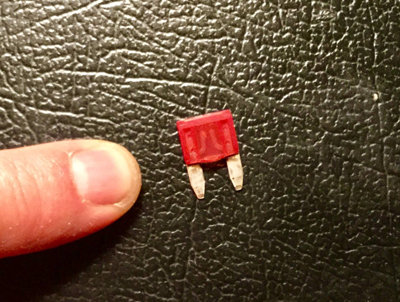 Lesson #1: This $2 fuse that failed is designed to save a $40K engine. While inconvenient, not a bad trade! Lesson #2: When we paid for another night at the marina, the office manager told us that five other boaters who ventured out this morning had also returned to port from saying the seas were too rough. In the end, God always has our back and on this day, He used a $2 fuse to bring us back safely to the marina so we could plan to venture out again on Friday. We woke early Friday and left the dock before the sun had come up. This day was noticeably different than Wednesday – calm seas and almost no wind. As we left the harbor and accelerated to 24 MPH I admit to holding my breath, hoping the engines would keep humming – and they did. Our trip to Hampton VA was calm and peaceful and we arrived on schedule approximately 5 hours later. 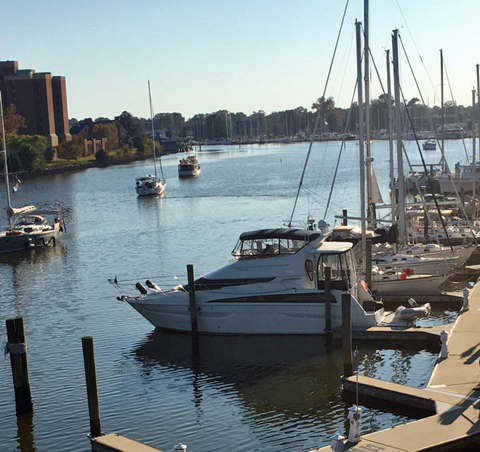 We decided to stay at a downtown marina, about one block from historic Hampton. As usual Blue was very anxious to get off the boat. Stephanie took him for a walk and discovered a nice park very close to the marina. Next up on our big adventure – The ICW! (Intra Coastal Waterway). Glad you’re safe Cap! Was trying to find your transponder so I could follow you down via marinetraffic.com but to no avail. Fair winds and calm seas down the ICW! 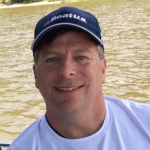 Hey Scott – do not have a transponder going (as far as I know!) but both Stephanie and I post regularly to FB and we’re getting better as keeping up with this blog! This makes me think of that lesson of charging for your value… the fuse was $2. How much did you have to pay the mechanic to tell you what the problem was? Ah, you’re right Jessica – the good ‘ol heater repairman story!